Our range of products include tensile testing machines. Tensile Test on Metals, springs, Rubber, Synthetic Materials etc. Compression Tests on Springs, Rubber etc. Bending / Transverse Test on Synthetic Materials etc. Useful for testing various materials like metals, springs, rubber, polymers, etc. Optional RS - 232 port for PC interface. Equipped with large analog dial for reading load. Autographic attachment for plotting . On line graph of Load vs Displacement. 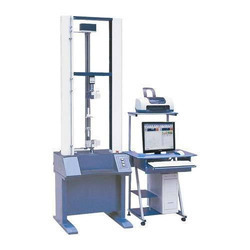 Looking for Tensile Testing Machines ?